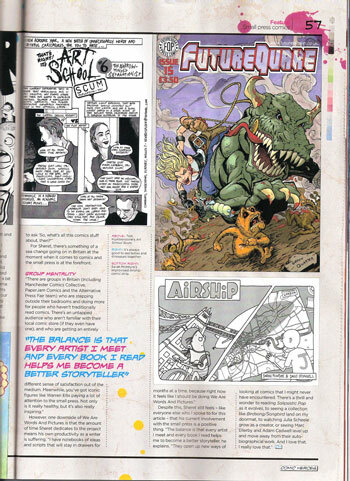 On sale now is Comic Heroes issue 3, which contains a rather splendid article on the UK Small press scene. 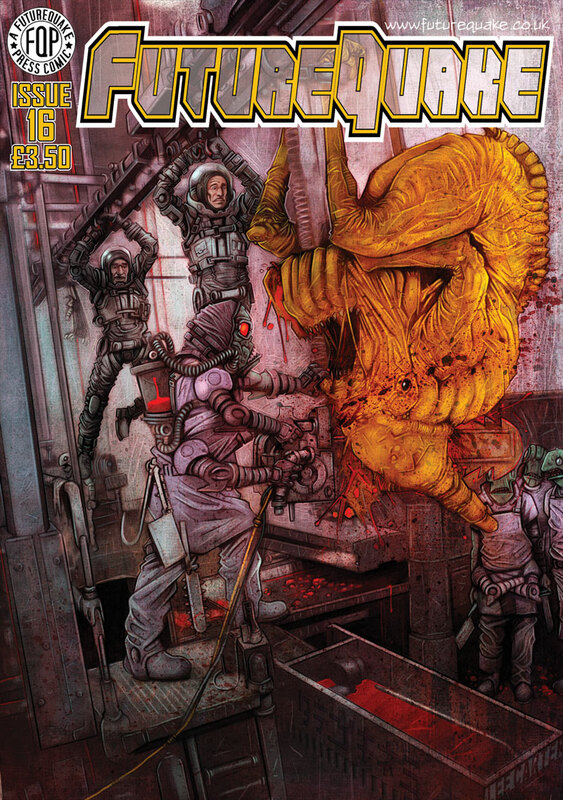 Written by Matt Badham, it quotes Both Richmond and myself, and presents the awesome cover to the new- bumper sized Dogbreath 23 by James Feist. 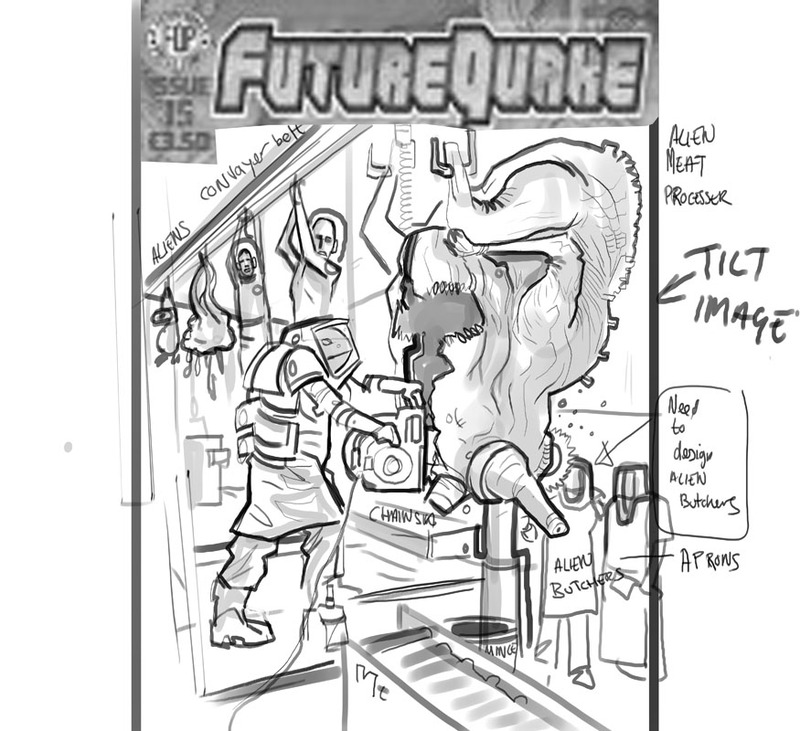 It also presents a small portion of Dylan Teagues illustration for Rose O’Rion (in Zarjaz) in a seperate feature and the fabulous cover to FutureQuake 15 is there too. The new issue of comic heroes is out at the moment, for the rather pricey £7.99. It has amongst its features a rather well written piece on the UK Small Press scene written by Matthew Badham. as part of the feature Both Richmond and Myself are quoted, and Gibson Quarters rather spiffy cover for FQ15 is presented. 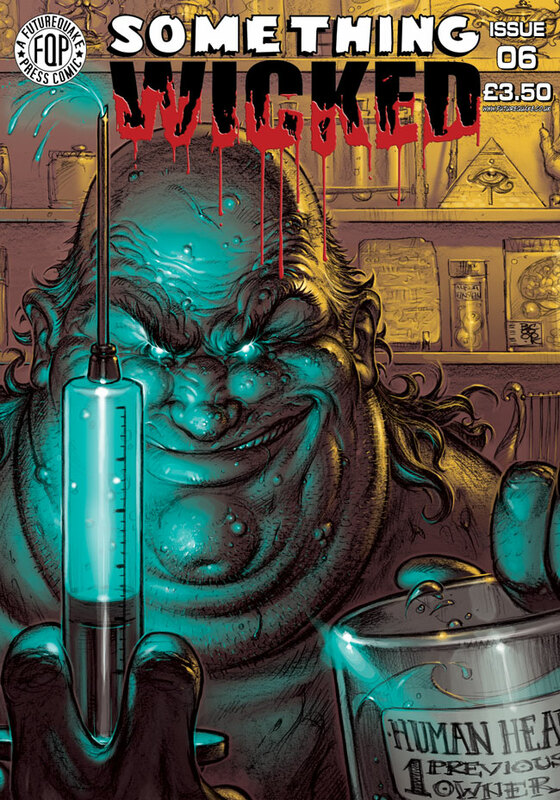 Also shown is the new cover for Dogbreath 23 by James Feist, but I’ll be putting that on The Quaequam Blog! MangaQuake is no more. 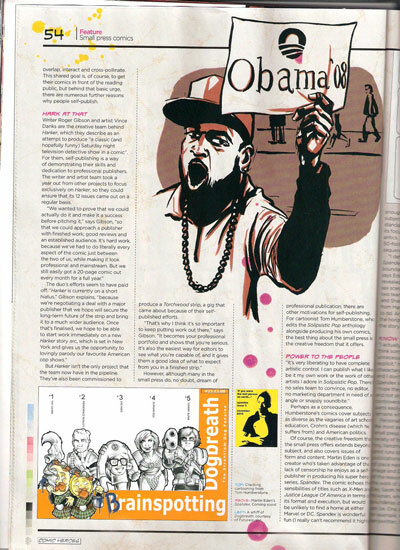 The last issue released was 07, back in Early 2008 ready for the first Hi-Ex up in Inverness. Since then, despite the best efforts of all here at FQP, we haven’t been able to get an issue together. The strips that are completed will be running here on the FQP Blog for the next few weeks, and they are fantastic stories that I would have been proud to print. 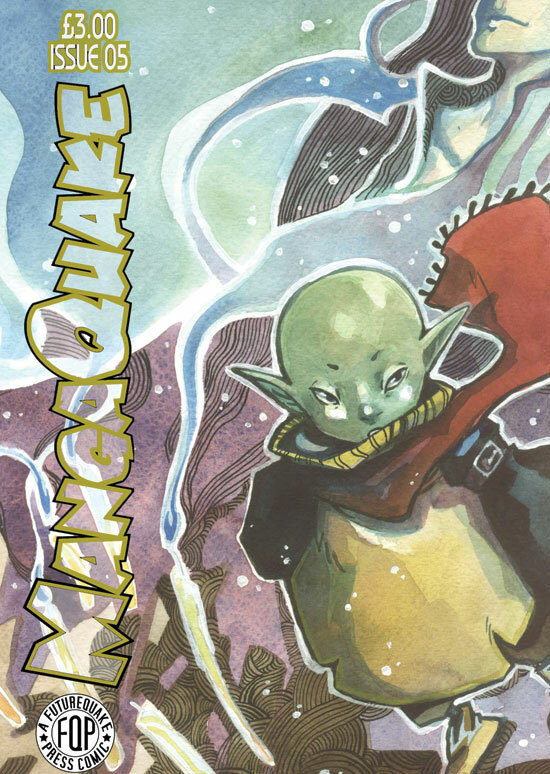 There are still issues of MQ available in the shop, and that is not going to change. 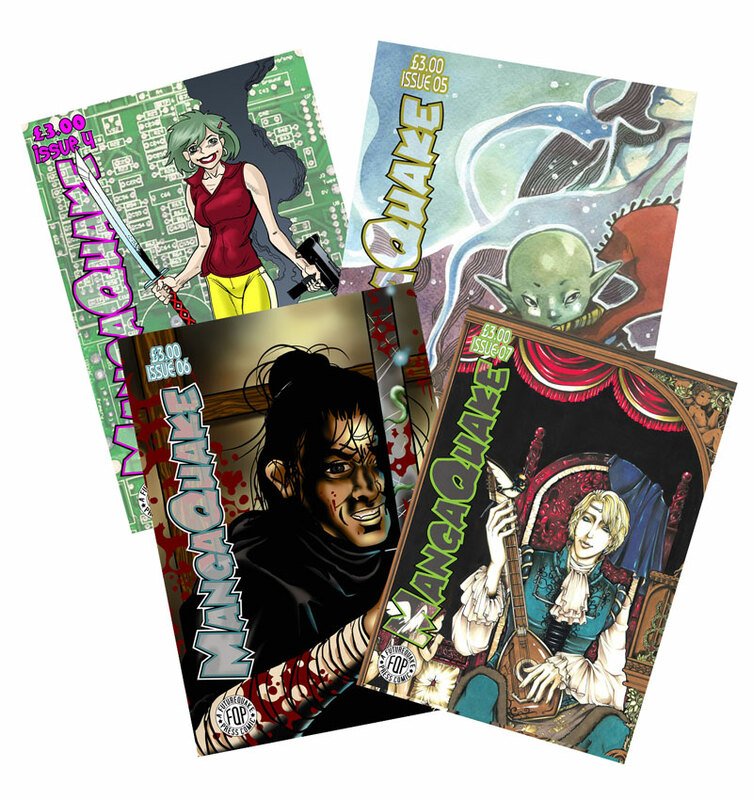 In the launch of the new titles I will be changing the issues available over to a low-price bargain pack to hopefully allow those of you out there who haven’t tried MQ to see some of what you missed. 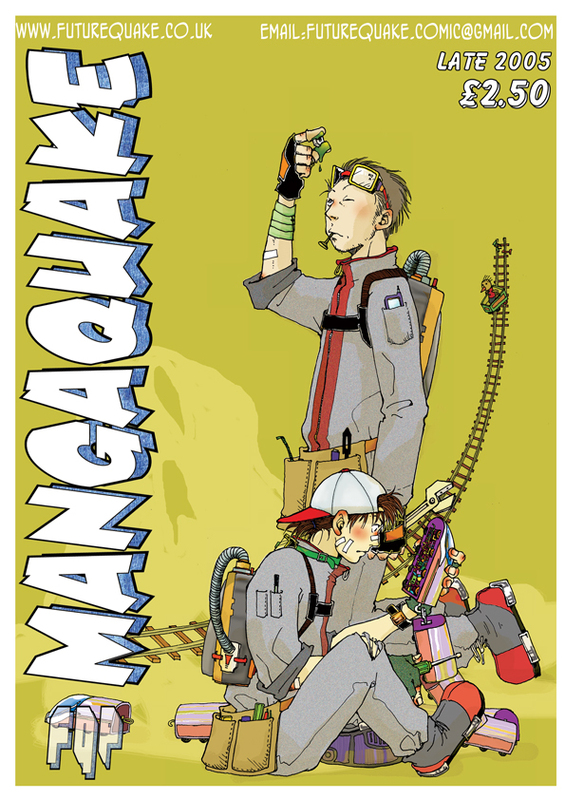 I want to take the opportunity now to thank all those who took the time to work on strips for us for MangaQuake- the title will be missed. 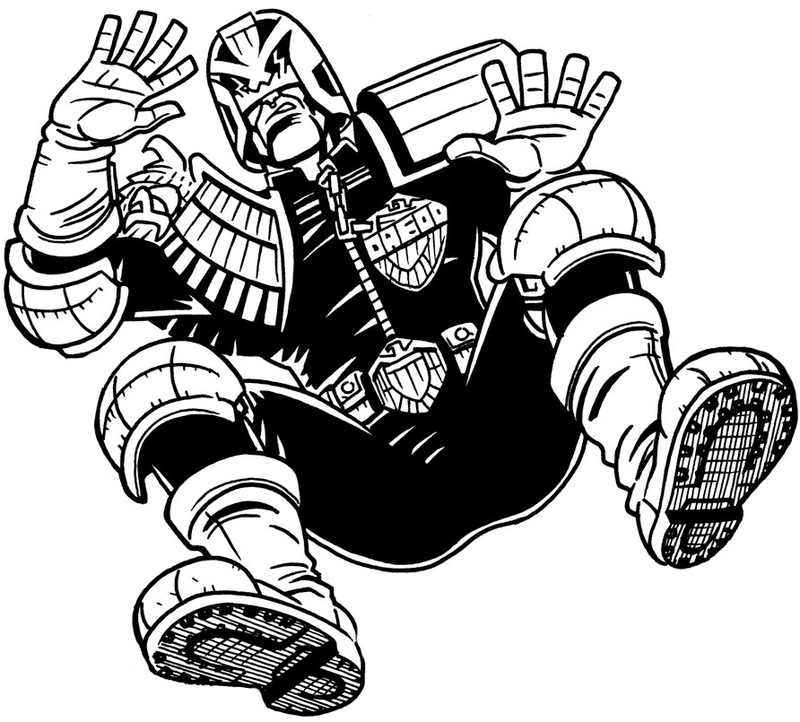 Judge Dredd- Death to the Future is a 10 page strip for Zarjaz by Lee Robson and Dunk! Nimmo. Strontium Dog- Death to the Future is a 10 page strip for Dogbreath by Lee Robson and Dunk! Nimmo. 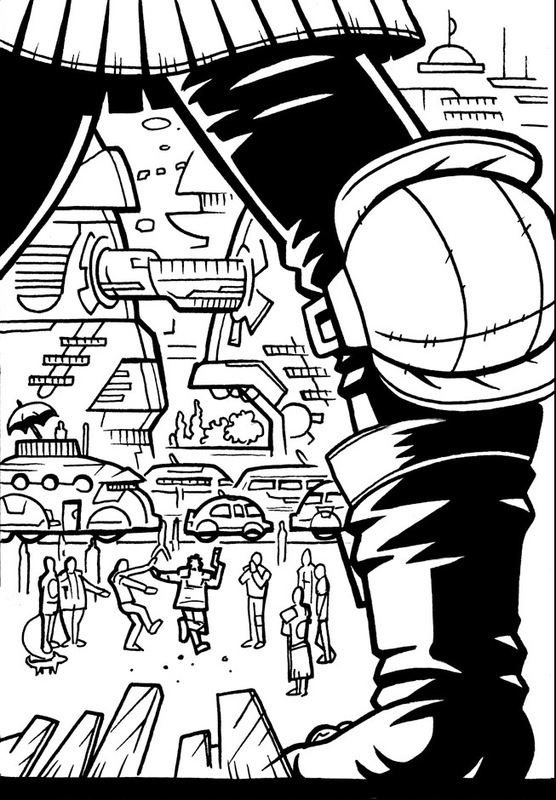 Zarjaz 10 and Dogbreath 23 contain between them 20 pages of crossover action from the minds of Lee and Dunk! 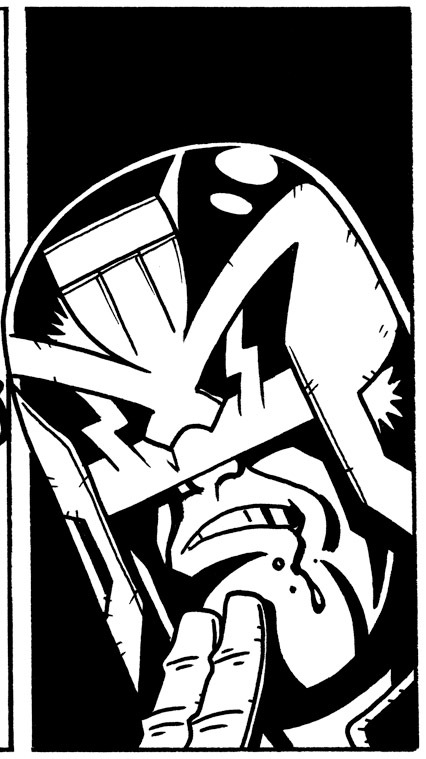 Over on his blog, Dunk has been posting preview panels for a little while, and he, like the rest of us here is justifiable excited about this- the first ever cross-over between the two oldest 2000 AD based fanzines. Dunk has also posted a step-by-step for the opening page of the saga. Lee has also posted about the launch over on his blog, and his prose is mighty. Both titles will be available in time for the BICS gig in October, and after that from the FQP Webshop. Remember, it’s not called Zarjaz for nothing- and you sneckin’ norms really have never had it so good! The cover to the latest FutureQuake, which will be on sale in time for the BICS gig in October, was very graciously provided by Lee Carter. 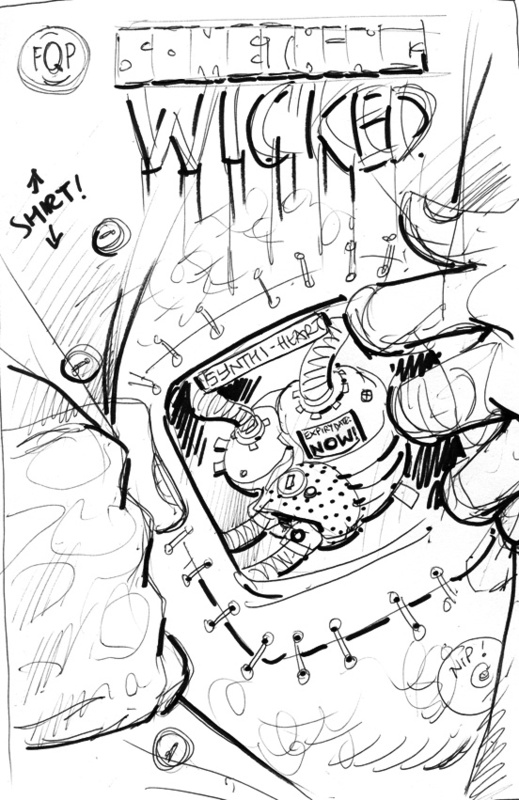 Lee was asked about this back at Bristol in May (and within a half hour of talking to Boo Cook about the cover for Something Wicked 06) and he was kind enough to agree. I sent Lee the script for ‘BARGAIN HUNTER’ and he sent me the rough below, which I was only too happy to approve. Lee Sent me the final image at the start of this week and I am proud to be able to present it to you. 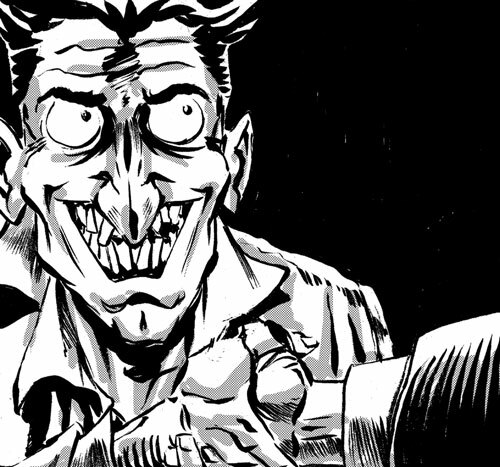 A fantastic, horrible image that serves to highlight the talents of one of the rising stars in UK comics. Thanks Lee. Meet Scooper, he’s one of the good guys, despite appearances to the contrary. 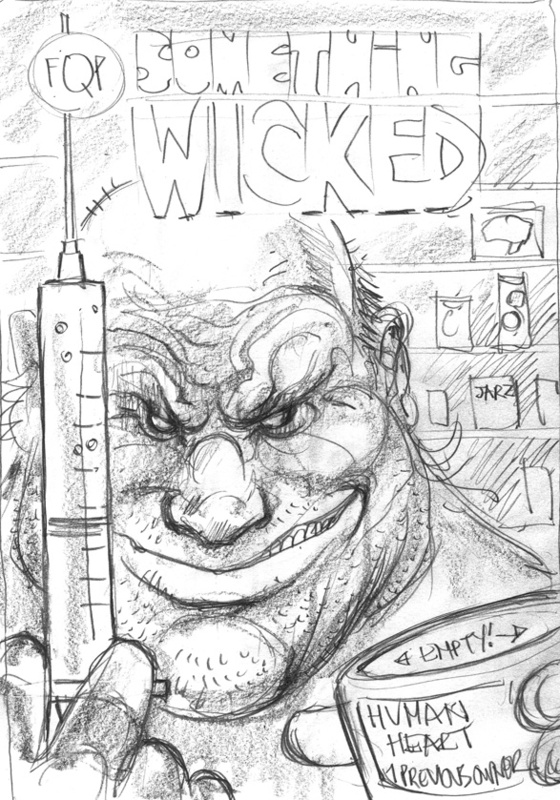 He’ll be appearing in Something Wicked 07, courtesy of writer Oscar Maltby and Artist Brian Beardsley. On sale in time for the BICS gig over the weekend of 15-16-17 October, this issues cover was provided by the stupendously talented Boo Cook! I asked Boo about this back in May at the Bristol expo, and despite being horrendously busy he said yes. 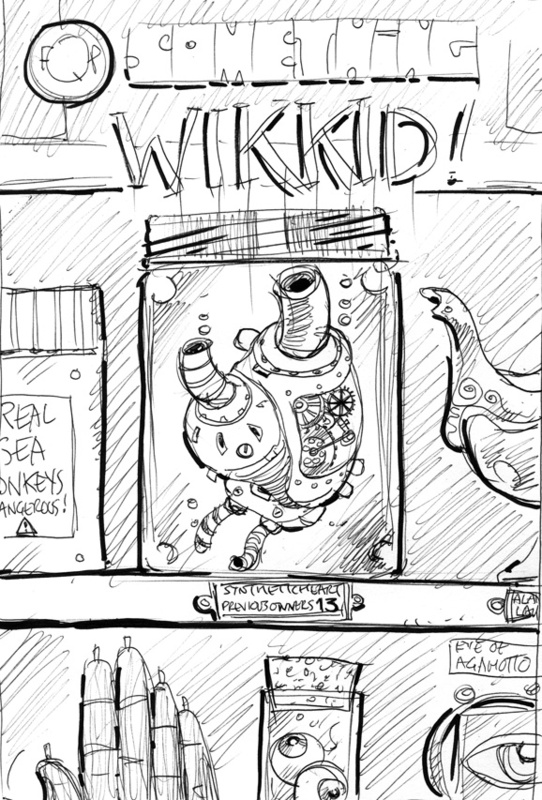 Fast forward to the start of September, and I sent Boo the script for Pawnshop Heart to read, as I had decided that it would be the lead strip for the issue. Boo sent me the pencil roughs for the pencil images below on the left and centre. Then I got the pages through from strip artist George Coleman. Just in time for Boo to ask if he could have a squizz at them. 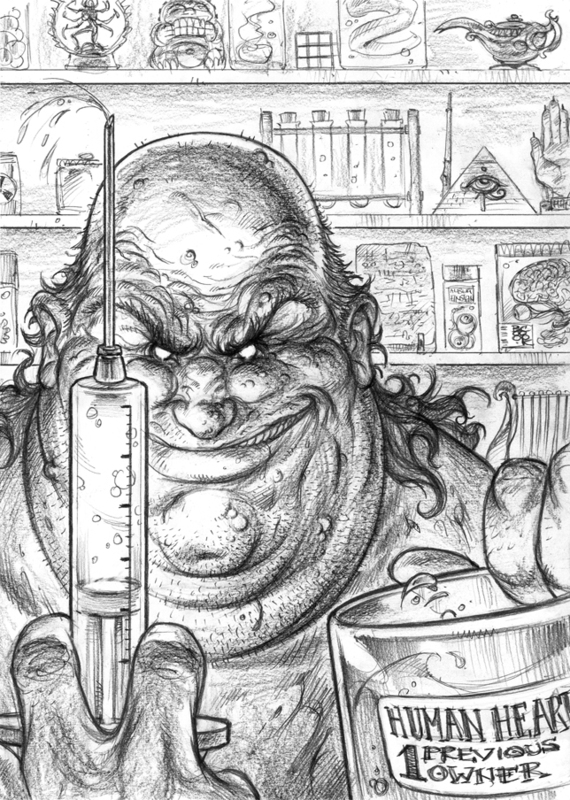 In what to me was an astonishingly short time, Boo sent me the pencils on the above right, which he was realy excited about getting to grips with..
And here is the resulting final pencils; which Boo worked up seemingly overnight into the final image at the top of the post. I’m incredibly proud of this cover, and think that it is a fantastic showcase for one of our finest homegrown talents- Thanks Boo!